I have been holding out all year (I have no idea why) but I finally purchased the Oskia Renaissance Gel Cleanser to see if it was worth the hype. It’s definitely one of my favourite cleansers, really gentle, it smells beautiful and it leaves my skin refreshed. I’ve been enjoying it all month but I’m already worried about it finishing soon because it’s definitely one of my more expensive skincare purchases from this year. Not as glamourous, but I’ve also been using the Mario Badescu Drying Lotion all month on any spots. It’s very good at preventing active breakouts from growing and dries them up before they can even fully form. If you have acne prone skin, I highly recommend having a bottle of this in your bathroom cabinet! I have a couple of favourites for hair. First up is the Living Proof No Frizz Nourishing Style Cream because it does what it says on the bottle. I’ve been searching high and low for a frizz taming styling cream that actually works and I hadn’t found one that did the trick until now. I have the travel size version and this is going to last me a long time because the tiniest squeeze goes a long way. 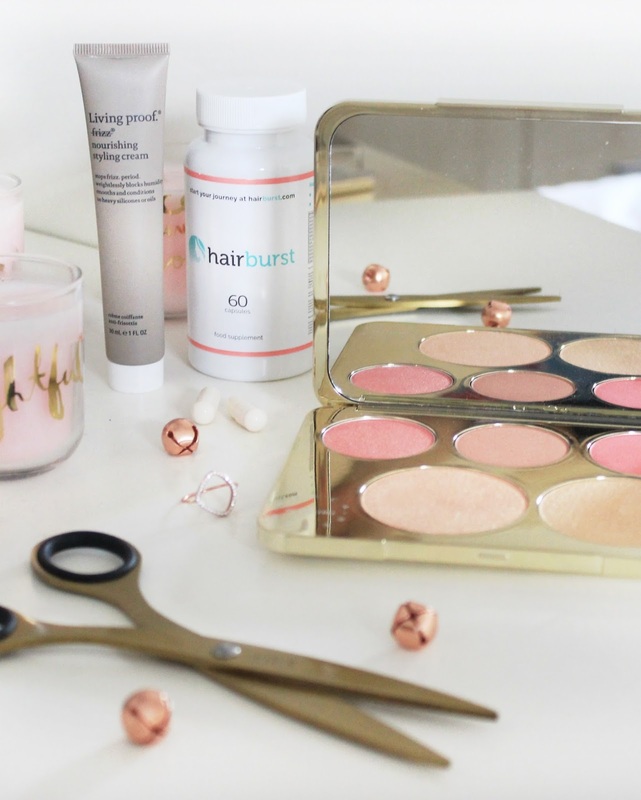 My other hair favourite is actually a supplement – I’ve been taking Hair Burst Capsules for about four months now and I feel my hair is definitely stronger and healthier. It is on the pricier side of supplements, but I have a feeling that the results are worth it. It usually takes about six months to see the full effect so I’ll keep you updated on what I think around February. Makeup wise, I’ve fallen head over heels in love with the Becca X Jaclyn Hill Champagne Face Palette. This was extremely hyped over the summer, but it was recently re stocked, and I’m so glad it was! 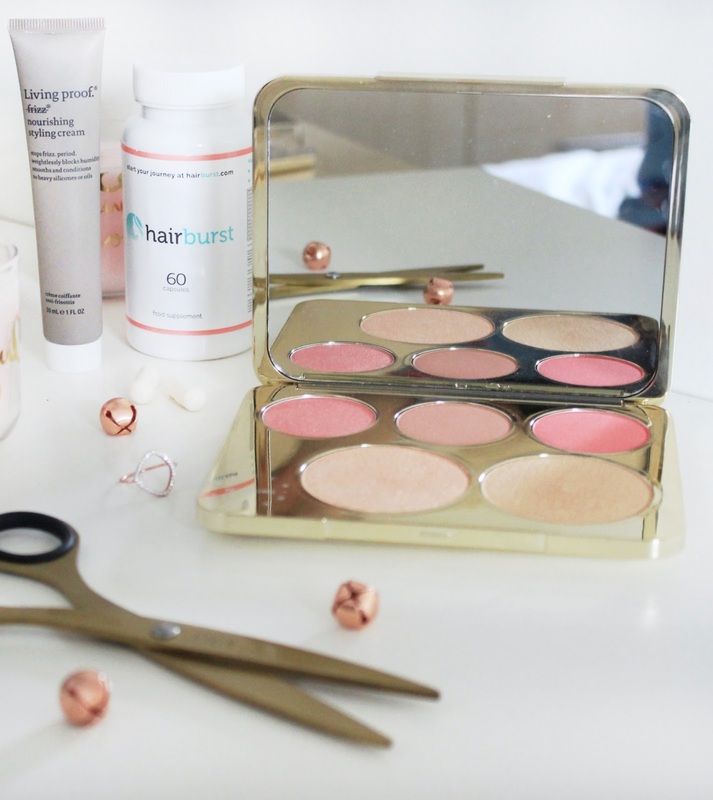 It’s a beautiful palette, with three gorgeous blush shades and two highlight pans. The packaging is absolutely stunning and the quality of each product is incredible. The palette retails at £48 but it is definitely worth it. It’s often out of stock though, so if you see it, get it whilst you can. Onto some random favourites… I purchased the Accessorize Organic Shape Ring at the start of this month because it reminded me of a similar looking one at a very luxury jewellery store. However, this one only cost me £15 and it looks just as beautiful! It is gold plated so it won’t tarnish as quickly either. Speaking of gold, these gorgeous Kikki. K Gold Stainless Steel Scissors are another recent purchase that I have totally been loving this month. They’ve helped me through all the gift wrapping of December, not to mention how stylish they look on my desk. In terms of Netflix favourites, I’ve been utterly obsessed (binge watching level obsessed) with Jane the Virgin. I can’t believe I hadn’t watched it sooner! It’s a cross between a comedy and a drama, it’s light-hearted and perfect to watch this time of year. I’ve also been dabbling into Big Bang Theory lately as some quick comedy and enjoying that as well. I know these are both really popular shows, and I’m excited that because I’m new to them, I still have so much to watch! I posted a recipe for Dark & Smoky Salted Caramel Hot Chocolate earlier this month. It’s my favourite hot beverage of the moment and I’ve been enjoying it on many cosy evenings indoors! The post seemed to be really popular – please let me know if you decide to make it yourself, I’d love to see a picture. I hope you all have a lovely New Year’s Eve!